It's snow joke that this protective ski jacket is made for the slopes. We've combined the perfect mix of quilted hardshell and softshell fabrics for stretch and protection. With a hood with detachable faux fur trim, lined fleece pockets, a high neck and pass pockets on each sleeve. 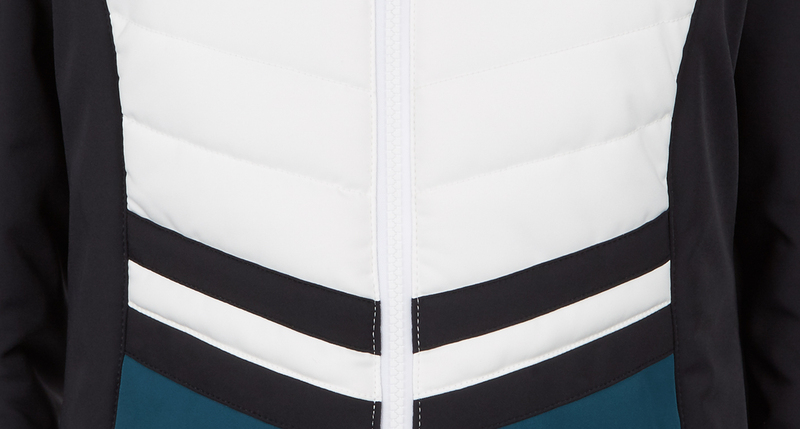 This flattering colour block style has a snow skirt to block out the chill and inside pockets for your phone and valuables. esigned for the slopes, this woven fabric is windproof, water repellent, breathable with a soft brushed backing to regulate body temperature. Composition: Shell 1: 65% Polyester, 31% Polyamide, 4% Elastane. Shell 2: 100% Polyester. Lining: 100% Polyester. Fur trim: 45% Modacrylic, 45% Acrylic, 10% Polyester. Insulation: 100% Polyester. Snow Skirt: 100% Polyester + PU. Storm Cuffs: 80% Polyamide, 20% Elastane. Method Hybrid Ski Jacket is rated 4.2 out of 5 by 6. Rated 5 out of 5 by Lisalee16 from Love the jacket; it looks great and is warm. Went skiing with it and I loved how comfortable and warm it is, besides being so flattering with my figure. Rated 5 out of 5 by AmandaS from Best snow jacket! I bought this jacket for a week long ski trip to Whistler and was never cold! It’s warm, practical, and looks great in pics! Rated 1 out of 5 by Won't so sweaty pammy from Poor design There is only one inside pocket and it is too small for my phone. No pocket for sunglasses or bigger items . However, I like the style and the matching inner wear . The coat is warm and the hood fits well over a helmet. Rated 4 out of 5 by SV Momma from Great looking ski jacket The only reason I did not give it five stars was because there was no place to put my phone on the inside of my jacket (at least that I could find). I had to carry it in an outside pocket which I really do not like. The jacket is fitted and is quite warm with a little vest underneath. Rated 5 out of 5 by BirdieSkiesUT from Warm, Functional and Unique After ordering last year and being SO disappointed in their CS, I decided to give SB one last chance and I am glad I did. My order this time came quickly and without fail. I love my underlayers and there is not enough I can say about this Great jacket. Like mentioned before, smaller inner pocket. However, the features of this jacket put it above my Canada Goose by 100%.